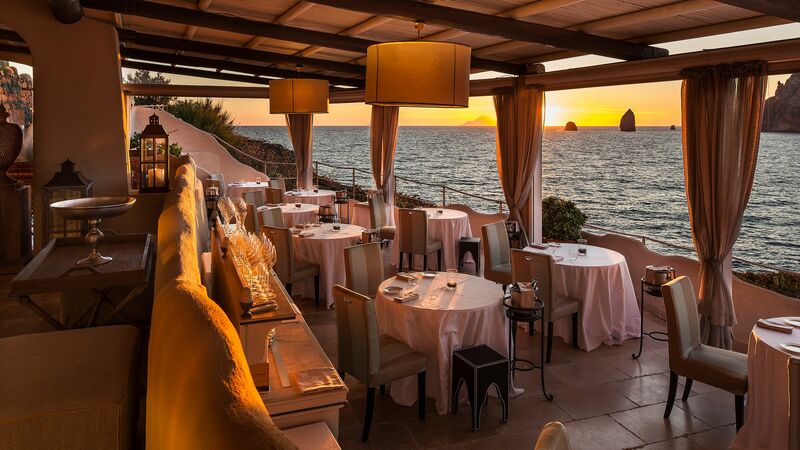 Nested on the cliff of Vulcanello, one of the most beautiful parts of the Aeolian Islands, Therasia Resort Sea and Spa is an exclusive five star hotel offering a contemporary experience with a touch of Mediterranean romance. It is one of the best places to spend holidays in Vulcano. With an unbeatable beach facing location, guests of Therasia Resort Sea and Spa can enjoy spectacular views from every angle of the property, which overlooks both the sparkling waters of the Tyrrhenian Sea and the majestic volcanic land surroundings. 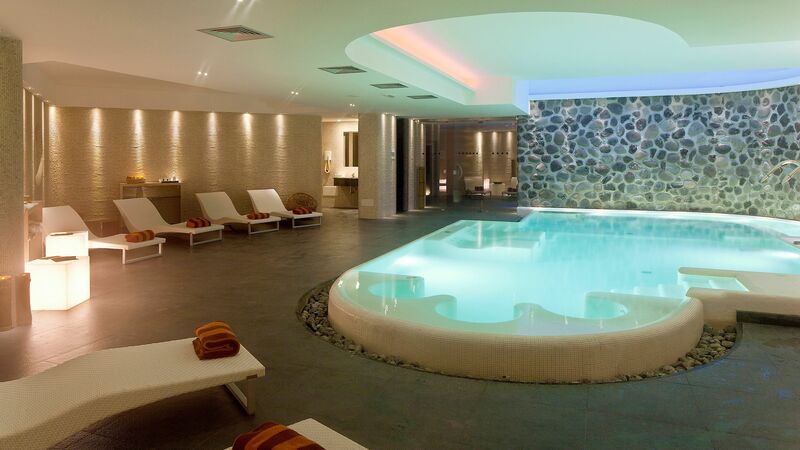 Inspired by the wild nature of the Vulcano Island, the hotel’s 97 rooms feature both sophistication and authenticity. The interiors are carefully crafted using local materials such as lava stones, cotto tiles, cedar, and olive wood while the look and feel reflects warmth, luxury, and comfort. For photography enthusiasts, the hotel holds perfect spots such as the charming steps down to the sea or the infinity pool side where sunset shots reveal the grace of the Aeolian Islands. And there is plenty for active guests as well. From Kayaking around Sicily and swimming in the volcanic pools, to discovering the local hidden shops of Vulcano, the list of things to do around the hotel is long but distinguished. Sovereign does not accept children at this hotel, however this is not an adult-only property. The hotel has 94 rooms. 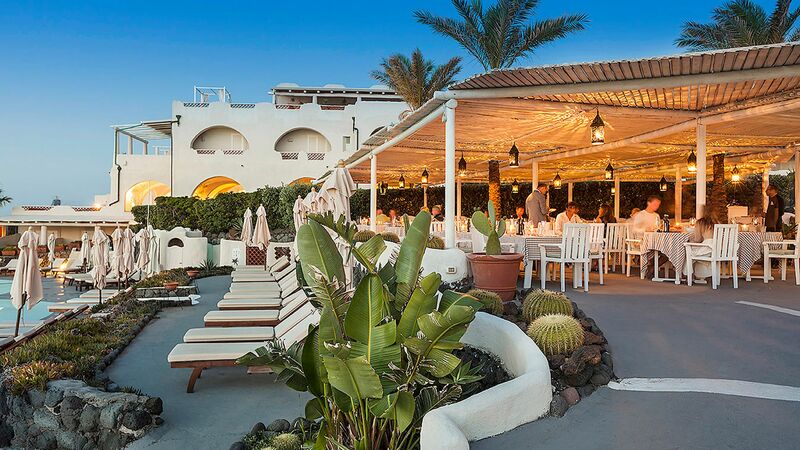 Conveniently located in the middle of Therasia Resort Sea and Spa, this celebrated restaurant offers a true gastronomy experience. The artistic colour blends and culinary fusions are inspired by modern trends while re-inventing the rich local tradition. Located nearby the hotel’s gorgeous infinity pool, I Russuri bar is a perfect spot to enjoy the famous Aeolian sunset over a refreshing Mediterranean cocktail. Russuri is the Sicilian equivalent for the word “sunset”. Il Faraglioni is the hotel’s terrace lounge bar where guests can comfortably enjoy views of the entire hotel while sipping a glass of authentic Italian wine. 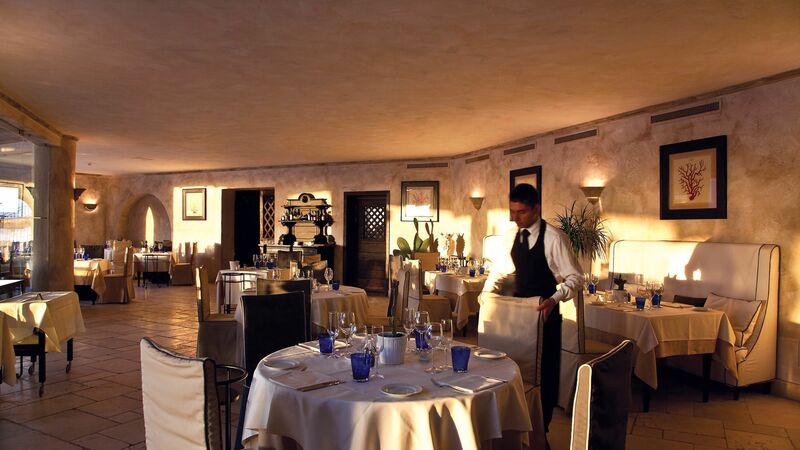 Il Cappero is the hotel’s Michelin starred gourmet restaurant offering classic Sicilian recipes in a casual atmosphere. 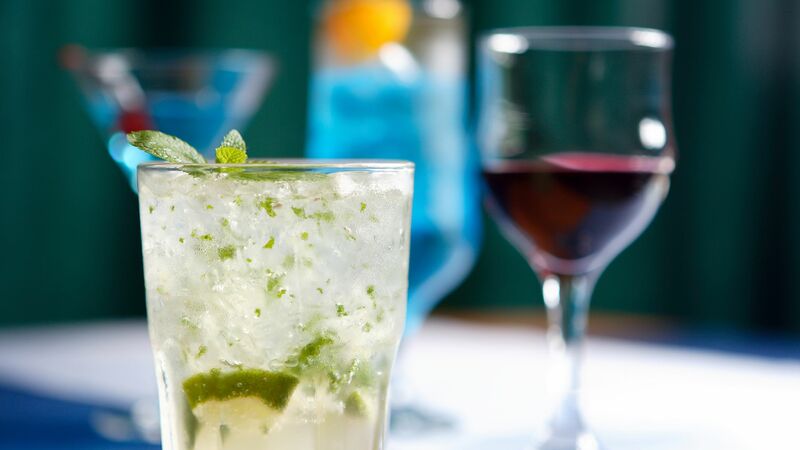 It is ideal for special events, anniversaries and exclusive parties. With a relaxed atmosphere, delightful meals and impeccable hospitality, L’Archipelago pays tribute to the Sicilian cuisine. Open: 07:00 - 10:30 and 20:00 – 22:30. Therasia Resort Sea and Spa’s infinity pool is one of the hotel’s most loved facilities among guests. It is surrounded by stunning views of the Tyrrhenian Sea, making it a perfect place for capturing unforgettable memories. The resort’s wellness centre offers everything guests need to enjoy a moment of peace and harmony. With a covered pool of warm water, a whirlpool tub, sauna, Turkish bath and a tranquil shower, the spa is well equipped to make guests feel like pampered royals. Vulcano is one of the neighbouring Aeolian Islands along the Sicilian coast of Italy, engraved with a collection of volcanoes, which gives it a unique outlandish landscape. It is a lively island where you can enjoy fantastic activities and beautiful scenery. The island boasts volcanic rocks, therapeutic sulphur mud and alum caves just waiting to be explored. 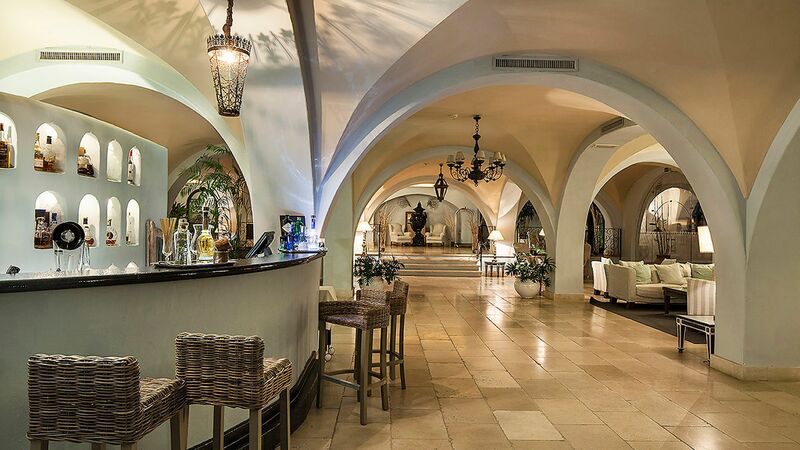 Beautiful hotels give visitors a peaceful, romantic and ideal vacation. The Island features strange volcanic pyrotechnics, while a number of hiking routes allow discovering the secret spots of this Mediterranean pearl, including zones where a humble countryside survives, keeping alive the spirit of Vulcano. With a ferry route operating up to 18 times per day and a sailing duration of approximately 10 minutes, visitors of Vulcano also have easy access to other Aeolian Islands such as Lipari. 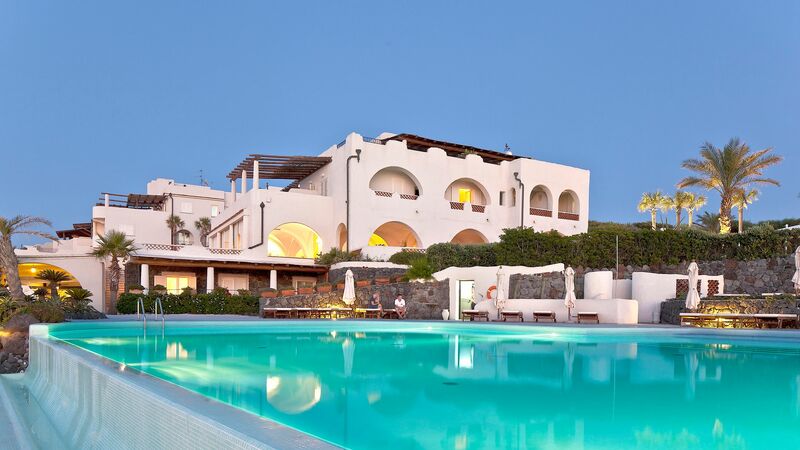 Therasia Resort Sea and Spa is a three hour transfer with a ferry ride from Catania Airport. Classic Double Rooms Balcony or Terrace are decorated in vibrant colours, featuring balcony or small terrace overlooking the resort's garden. Facilities include air conditioning, satellite TV, minibar, safe and wifi connection. Comfort Double Front Sea View Rooms Balcony measure approximately 20-23m² and enjoy full sea view from the balcony. Deluxe Double Front Sea View Rooms Terrace measure approximately 22-27m² and include large terrace with sun beds and full sea view. Junior Suites Front Sea View Balcony measure approximately 30-37m² and feature a large sitting room and balcony overlooking the sea. Suites Front Sea View Terrace measure approximately 42m² and have a full sea view from the large furnished terrace, a spacious lounge and four-poster bed. Master Jacuzzi Front Sea View Suites Terrace feature a spacious terrace with a whirlpool and lovely sea views. Save up to 10% on the hotel price for holidays between 19 April - 09 August 2019 and 24 August - 19 October 2019 booked by 30 April 2019. Guests receive one free spa entrance per person per stay, as well as 10% discount off all treatments and massages and 50% discount off additional entrance to the spa for holidays between 19 April - 19 October 2019. Guests receive a complimentary bottle of sparkling wine for holidays between 19 April - 19 October 2019 when staying a minimum of 7 nights. Stayed here when on a trip to the islands. Bad weather stopped us going to Stromboli but the resort and town were sufficient compensation for us. Lovely village and people. The cacti ere impressive and the boat traffic varied. Stayed for a few nights on a VJV tour. Lovely location. Paid extra for sea view and it was worth the supplement. However, the bathroom had a "bad drains" smell. Now being charitable, this could be down to the fact that we were on a volcanic island with sulphur smells all around. But I think it was the drains - and the mosquitoes loved it and we were both badly bitten during our stay. Dinner was included on the first evening and clearly we were on the "tour-group special". Group food mass catering and not terribly good with very limited choice and though the a la carte menu looked better, the prices were a bit high for us. Breakfast in the morning was brilliant however. “ Generally good, but could do better! Has the potential to be very good. The Therasia Resort Hotel is beautifully situated on Isola Vulcano within Italy's Aeolian Island archipelago and from the dining room there are some beautiful views across the sea to the other islands. The weather was perfect when we were there, and azure blue sea and clear skies made this an idyllic holiday retreat, albeit that getting to and from the island can be a bit of a challenge. The accommodation and hotel facilities were generally very good and MOST of the staff were very helpful and friendly (more about the exception in a moment!). We had slight concerns beforehand that the smell created by volcanic activity might spoil things, but actually, at the hotel you are too far away from any of the volcanic fumeroles to be affected. In the port however, there are a few quite whiffy areas, so chose an upwind restaurant if eating in the port (unless you like the smell of rotten eggs!). We were slightly disappointed in the repetitive evening menu in the main dining room (Arcipelago Restaurant): although there were some 'seafood specials' added to the menu, the basic menu did not vary during our stay, and it was easy to become tired of it. Understandably, given Vulcano's proximity to Sicily, the hotel was keen to promote Sicilian food, but we were surprised that in a supposedly 5* resort, there was a total lack (in the main dining room) of any international cuisine, or even for that matter, Italian food from outside the region. The Sicilian food that was served was of a good quality, but a greater variety would have been appreciated. Breakfasts were outstanding. The food was varied and plentiful, although on occasions some things ran out and were not replenished unless you made a point of seeking out staff and asking. (e.g. the orange juice). Drinks are expensive and unless you are on an all-inclusive deal, the temptation to go in search of more varied food and drink at a reasonable price is very strong, and as a result, we ate in the port area on a number of nights. The complimentary shuttle service was efficient (although a change in timetable on one day wasn't properly advertized). The one thing that very nearly spoilt an otherwise pleasant stay here, was the attitude of ONE of the sommeliers in the dining room. One of the sommeliers was very good and very friendly, the other was possibly auditioning for a role in Fawlty Towers. He was unspeakably rude, inattentive, and unprofessional, and to this day, we have no idea what we did to upset him (as he seemed to single us out for this childish and unacceptable treatment). Not only did he seem to get upset that we wanted our wine with our meal (how terribly unreasonable of us! ), but clearly didn't approve of OUR choice of wine (that was on the first day) and on subsequent days, he strutted around the dining room as if he was God's gift to to the sommelier trade and demonstrated incredible skill in avoiding serving us. On one occasion when we did manage to ask him for service, he went away from us muttering in Italian under his breath, and perhaps it is just as well that my Italian is not good enough to understand what he was saying because his attitude was unmistakably hostile . We never did get our wine, and only the very helpful intervention of the other sommelier prevented us from complaining directly to the resort manager about this pathetically inadequate excuse for a man. It certainly left a bitter taste in the mouth for a few days whenever we saw his scowling face in the dining room. The grounds were neat and tidy, although I did feel that a 5 star hotel could have made more effort with their 'gardens'. The main pool and various plunge pools were lovely and access to the sea for sea-swimming was also good. There were plenty of sun-loungers either around the pool or in more secluded parts of the grounds if that's what you prefer. So overall, we had a good holiday at the Therasia Resort, but it certainly isn't worth the 5 star rating and it could certainly do a lot better if it tried. Would we return? Probably not: there are hotels that provide better levels of service where the cuisine is more varied and drinks aren't overpriced. The sort of hotel that when you see pictures in advance you cannot wait to get to - in reality it does not live up to the promise. It took ages to be allocated our rooms, everyone had to be individually shown by a man who unlocked the door for you as if you were incapable of doing it yourself. My room looked wonderful - huge - but when I drew back the curtains to the patio the staff were having their break sat on the patio wall smoking cigarettes. Next door were screaming children. The shower had no door to the cubical so I flooded the floor. Then dinner - 10 euros for an undrinkable glass of wine. (Back home you can buy 2 bottles of better stuff for that price). The food was a joke. Starters that were at most 2 bites. The main courses were just as small. Hardly worth the wait - our table was booked for 8 pm and by 9.30 we were still waiting to eat. If you had the fish - cod - that was all there was on the plate, a lump of fish about 2 by 3 inches, no vegetables or potatoes or anything else. One waiter refused to tell us what the desserts were and then when we did find out they lost the orders and had to come around and ask again. All the waiters were very rude and one pushed a man in our group to get past him, no 'excuse me please,' or anything. Breakfast was better, however they ask if you would like tea or coffee but then don't bring it. When I got back to my room after 'dinner' luckily the screaming children were asleep, however overhead had a plumbing problem, with constant running water. By 5 am I had had enough, packed my case and phoned reception to see if it was an empty room overhead with a leaking valve from the shower or something as I did not think that if there were people in the room that they could sleep through all the noise either. Unfortunately the chap on reception did not speak English well enough to understand. I spoke with someone else about 7.30 am and was told I could change rooms. The second room on the other side of the complex was smaller - but the shower was much better and had a door! However, there was a crying baby this side. Why do hotels not house all the people with children in one area? In either room the only sockets my adapters would work to charge my camera was if I unplugged the TV. In the end I was only too pleased to leave this place. Nice location - yes. Relaxing - no.